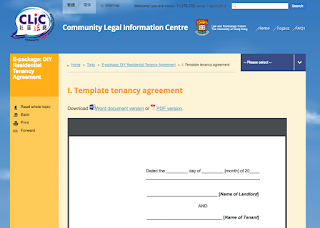 The online Community Legal Information Centre (CLIC) recently uploaded an e-package of Do-It-Yourself (DIY) Residential Tenancy Agreement. 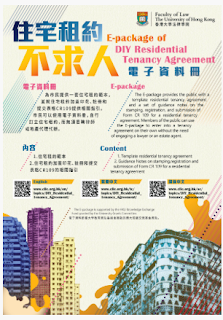 The package includes a tenancy agreement template in English and Chinese which tenants and landlords can use to structure their legal relations. Principal Lecturer Dora Chan, Adjunct Associate Professor Edmund Cham, and their team of students/graduates developed the templates along with a set of guidance notes with the assistance of the HKU Knowledge Exchange Fund. HKU Legal Scholarship Blog caught up with Dora to find out more about her project. 1. What motivated this project and what is its aim? Currently, if members of the public want to enter into a tenancy agreement on their own, the most common means is to buy a sample tenancy agreement from a stationery shop or to download a sample agreement from the internet. All these samples are not satisfactory as they are not prepared and reviewed by persons competent in tenancy law. In one of the stationery shop sample, one of the clause refers to legislation from 1952 which had been repealed and some of the terms used in samples are archaic. If the public use inappropriate samples for renting their residential homes, it may result in disputes and problems between the landlord and tenant which can have significant impact on their daily lives. In many cases, the public may not want to engage a lawyer to prepare a residential tenancy agreement as it can be costly and time consuming. The aim of the E-package is to provide the public with a properly prepared residential tenancy agreement template. Members of the public can enter into a proper residential tenancy agreement using the E-package without the need and costs to engage a lawyer or an estate agent. 2. Who are the targeted beneficiaries? Any member of the public who would like to enter into a residential tenancy agreement on his or her own. 3. Can this substitute for the assistance of a lawyer or only supplement? Depending on the individual circumstances, if the transaction is a simple letting of a residential flat, the public can use the template tenancy agreement by filling in the essential details of name of parties, rent, term of tenancy and deposit and they can have a workable tenancy agreement. For complicated transactions, they may still need to engage a lawyer. 4. Is there a purpose to having a bilingual agreement? It would give a choice to the public as to whether they want the tenancy agreement to be in Chinese or English. 5. Why should someone use this new “E-package of DIY Residential Tenancy Agreement”? 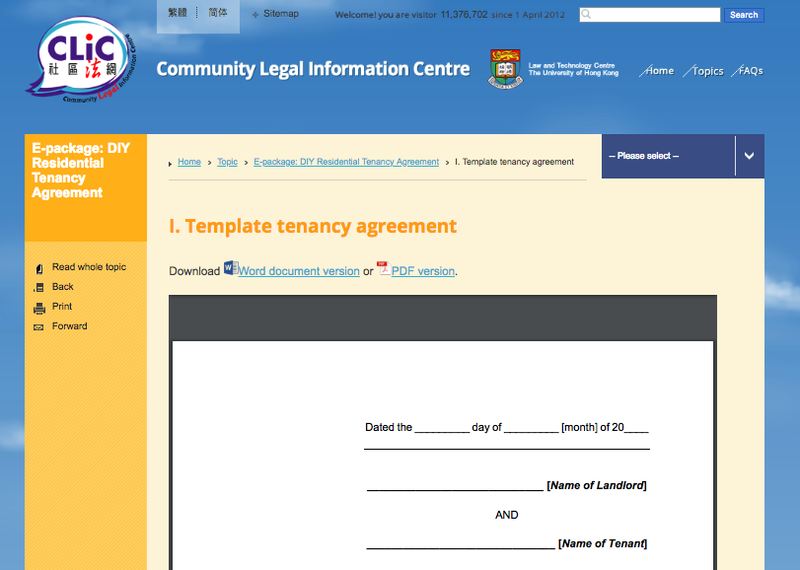 The public can have free online access to a residential tenancy agreement properly prepared and vetted by the students and staff of the Faculty of Law, HKU who have competent legal knowledge on HK tenancy law. The guidance notes also provide a comprehensive guide to the public on how to stamp and register timely a residential tenancy agreement to avoid incurring late fees and penalty. 6. How is this related to HKU's goals to promote knowledge exchange and experiential learning? In the course of preparing the E-package, the law students in the E-package team gained the valuable experience in applying their legal knowledge and English and Chinese drafting skills in preparing the E-package which is beneficial and useful to the general public. The practical experience gained by the students in producing the E-package would be most advantageous to them as future lawyers and would also serve the worthy purpose of knowledge exchange between HKU and the society. 7. Why is this project unique? As far as I am aware, the E-package is the first online website which provides a properly prepared residential tenancy agreement template and comprehensive guidelines on stamping and registering a residential tenancy agreement. 8. Who can access the free agreement package? And, where? 9. What if the users encounter problems when using the e-package? Who can they contact? What can they do? The E-package is intended to be a self-explanatory document. If the public finds the E-package does not suit their specific needs, they would have to seek legal advice from a lawyer.